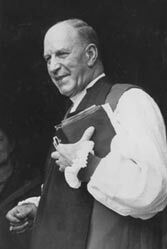 Russell White was Vicar of Tonbridge for fourteen years from 1945 to 1959 and the first Bishop of Tonbridge for the following nine years until 1968, a total of twenty-three years closely connected with the town. He was born in London in 1896, attended the City of Oxford School and then served in the Queen's Own Oxfordshire Hussars from January 1915 to the end of World War I in 1918. After obtaining his degree in Modern History at St. Edmund Hall, Oxford, and attending Wycliffe Hall Theological College, he was vicar of several parishes in turn and at one time Chaplain to the Mercers' Company. On becoming Vicar of Tonbridge immediately after World War II, he was largely instrumental in raising thousands of pounds for the major restoration of the Parish Church which had suffered war damage and general neglect for some years previously. Among the many fund-raising events was an Old English Fair held at Tonbridge Castle and opened by HRH The Duchess of Kent. 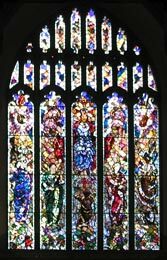 The culmination of this work was the installation of the highly acclaimed great East Window of the Parish Church designed and made by Leonard Walker. During his time as Vicar, Russell White was appointed Rural Dean of Tonbridge, a Proctor in Convocation, an Honorary Canon of Rochester Cathedral and was also Chaplain to Sir Harry Goldsmid, High Sheriff of Kent. Having founded the Twickenham Philharmonic Society in his previous parish, he now started the Tonbridge Philharmonic Society. He also joined many other Tonbridge Societies and Clubs, sometimes invited to be President, ranging from Rotary, Rugby and Boy Scouts to the Ancient Order of Buffaloes. 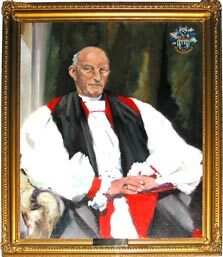 On his retirement as Vicar and appointment as first Bishop of Tonbridge, Russell White was held in such high regard that, in addition to a number of other presentations, the townspeople of Tonbridge subscribed to an oil portrait of him in his bishop's robes which was presented to him by Councillor Mrs Burke in the Castle on the understanding that Tonbridge Urban District Council should act as its guardian and hang it the Council Chamber. The portrait, shown here, remained in the Castle for several years but is now in the vestry of the Parish Church. As Bishop of Tonbridge, the now Right Reverend Russell White had to assume a much wider area of responsibility in the diocese and national church but he kept closely in touch with his former parish and the people of Tonbridge. His signature became 'Russell Tonbridge', in the manner of all bishops and during this time he lived in Tunbridge Wells. 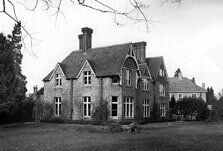 On his retirement he moved to Dorking where he died in December 1978. A large Memorial Service, at which the Bishop of Rochester preached, was held in January 1979 in Tonbridge Parish Church. Many other details of his life were published in the Tonbridge Free Press, the Courier and other newspapers. *From Tonbridge Free Press Centenary by H. R. Pratt Boorman and Eric Maskell, 1969.